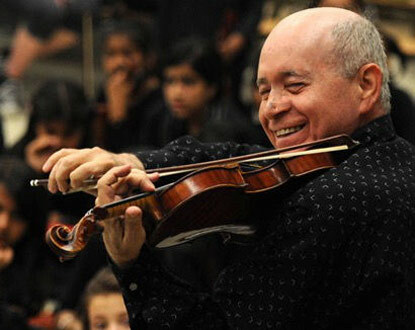 Admired for his artistic style, unique interpretations and vibrant tone, violinist Moshe Hammer is Hungarian-born, was raised in Israel and studied there with Ilona Feher. As a student of Jascha Heifetz he was a medal winner at the Concours Jacques Thibaud in Paris. Hammer’s tours have taken him across North America, Europe, Israel and the Far-East. His performances have consistently energized critics, thrilled audiences and earned respect among his colleagues. A naturalized Canadian, Moshe Hammer has traveled the concert venues of the world and performed with many symphony orchestras. He was also the founder and leader of the Toronto based chamber group, The Amadeus Ensemble. As member of Da Camera, he has thrilled audiences in Canada, the US and Europe with regular visits to the Netherlands, including the world renowned Concertgebouw in Amsterdam. Moshe is a regular and welcome guest in various music festivals on both sides of the Atlantic Ocean. He brings to his performances a charismatic stage presence, a tone of unmatched subtlety, vitality and artistry of the highest order. Hammer loves to work with young musicians and offers master-classes everywhere he travels. His wide ranging discography reflects a multi-faceted talent. In 2007 Moshe launched The Hammer Band – From Violence to Violins. With this project, school kids in priority areas are presented with free music lessons and violins. We Help Kids Change Their Tune!